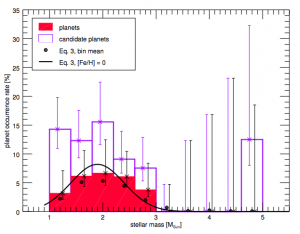 Are more massive stars more likely to have planets? It’s hard to be sure, because although we have found lots of planets outside our Solar system (about 1500), we haven’t found very many orbiting massive stars—only 60 or so. Why? Because it’s really hard. Planets are easy to detect if they are similar in size and mass to their host stars. Big planets orbiting small stars are easy to find with the transit method, where you detect a dip in a star’s brightness as its planet passes in front of it. Massive planets orbiting low-mass stars are easy to find with the radial velocity method, where you measure the motion of the star as it wobbles around the centre of mass of the star-planet system. It’s really hard to find any kind of planet around big, heavy stars. Figure 1. The 17 confirmed planets (solid red) and unconfirmed planet candidates (pink) binned according to the metallicity of their host stars. More of these planets orbit metal rich stars. Thankfully, stars die. As massive stars use up their hydrogen and evolve off the main sequence to become giants, they get bigger (a killer for the transit method) but they also get cooler, which makes them better radial velocity targets. In really hot stars, atmospheric metals are usually ionised, so they have only a few absorption lines. 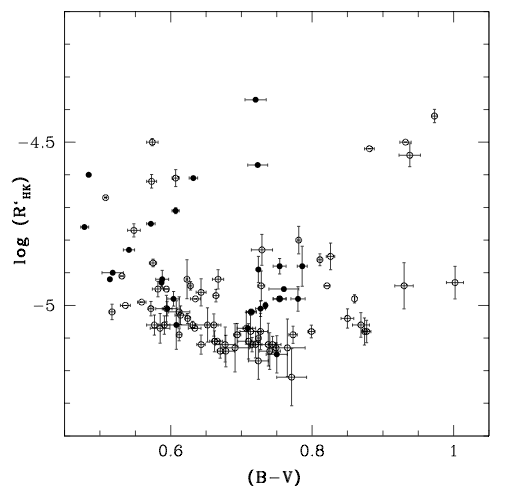 Cool stars have lots of absorption lines in their spectra because non-ionised metals can exist in their atmospheres. Lots of absorption lines means more accurate radial velocity measurements (remember, the difference between the position of the stellar lines and the lines produced in the lab gives you a radial velocity). More lines = more measurements = greater accuracy. Since more accurate radial velocities can be measured for cooler stars, exoplanets should be easier to detect around the cool, giant descendents of hot, massive stars. By searching for exoplanets around giant stars using the radial velocity method, Reffert et al. attempt to establish whether massive stars are better planet makers. They also ask: do stars with more metals have more planets? ‘Metals’ is the word used by astronomers for any element heavier than Helium. Since planets are often made out of heavy ‘metallic’ elements, it makes sense that stars containing more metals might host more planets. The metallicity of a star can be measured from its spectrum and is often expressed as the ratio of iron to hydrogen, [Fe/H]. Reffert et al. measured the radial velocities of almost 400 giant stars over 12 years using observations from the UCO/Lick Observatory in California, finding 17 exoplanets plus a few more candidates. 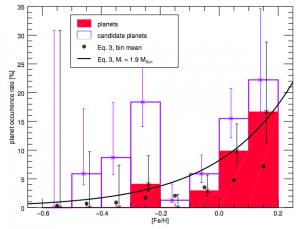 The number of planets as a function of metallicity and host mass are shown in figures 1 and 2. They detected more planets orbiting metal-rich stars. They also saw that the number of exoplanets increases with stellar mass up to about 2 solar masses, after which it begins to decrease once more. Figure 2. The 17 confirmed planets (solid red) and unconfirmed planet candidates (pink) binned according to the mass of their host stars. There are no planets orbiting stars greater than 2.7 times the mass of the Sun. 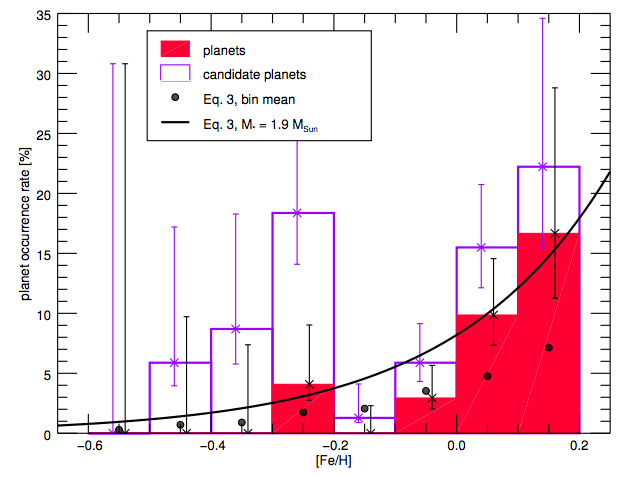 Trends amongst the candidate planets (in pink) are less clear, which may be a sign that they are false positives. False positives can crop up because giant stars pulsate on the same sorts of timescales as planet signals and disentangling the two can be extremely tricky! Massive stars contain lots of matter, obviously. They also tend to leave a lot of left-over material in a surrounding disc after they’ve finished forming. It is from this left-over matter that planets can form. This accounts for the observed trend: larger stars leave more ‘stuff’ and therefore more planets can form. However, Reffert et al. don’t find any planets at all around stars more than 2.7 times the mass of the Sun. One suggested explanation is that the disc of left-overs may be shorter lived in more massive stars. Another is that planets orbiting massive stars have to form far out in order to cool down enough. It may not be possible to form planets very far out because the disc becomes less dense and the material in it doesn’t move very fast. Of course, as I explained above, planets orbiting more massive stars are harder to find, so this observation could also be the result of a detection bias. However, the authors are confident that they should find planets if they exist (at least those which are massive enough with short enough years to be detectable in their survey). The trend for increasing number of planets with increasing metallicity detected here is a reassuring one as it aligns with theoretical predictions. Since planets are mostly made of metals it makes sense that more planets will form if a star has more of these metals in the first place! This paper adds to the increasing body of evidence showing that metals enhance planet formation and, when it comes to stars, size does matter. Finding dust grains (and planetesimals?) in a circumstellar disk Disk Destruction in the Trapezium Where the Wild (Planet)Things Are Are Stars with Planets More Active?